Pennsylvania Finds Gold in Dallas! Also, congrats to the folks at Crossing Vineyards who took home a bronze! Well done! 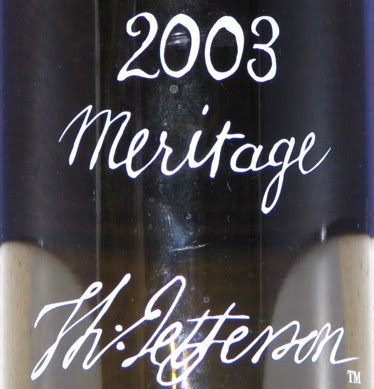 Kudos to Jefferson Vineyards. Jefferson is fast becoming one of the leaders in wnemaking on the eastcoast. Over the last three years the tastings I have had of these wines continues to improve, making outstanding wines! Dallas Morning News is one of the tughest wine comepttions out there. And New york took home beau coup medals. Congrats to all! NEW WINERIES keep popping up, including many in unexpected places. Now that the Thousand Islands-Seaway has become an established region (who knew?! ), the next newcomer is the Champlain region—near Lake Champlain which separates New York and Vermont—which already has three wineries, with more to come. This week we got notice that Eminence Road Farm Winery in Long Eddy is officially open and will be selling at area farmers’ markets and local wine shops. Owned by Jennifer Clark and Andrew Scott, the winery is located in a mountain valley in southern Delaware County (no wineries there before!) and is making unfined and unfiltered Cabernet Franc, Chardonnay, Gewurztraminer, Dry Apple Wine and others (visit www.eminenceroad.com). When I first came to this industry 27 years ago, there were wineries in about 7 counties—compared with 45 now (of 62), which is just wonderful politically. Frankly, the industry is growing so fast it’s hard to keep up with it. As far as I know there are now 262 fully licensed (federal and state) wine producers (not including satellite stores), with many licenses still pending at the State Liquor Authority. Last week, a representative from the federal Tax and Trade Bureau said New York now has 294 TTB-approved licenses, which means we’ll probably top 300 in the near future. Now I ask you: What other industry in New York State is growing that fast? 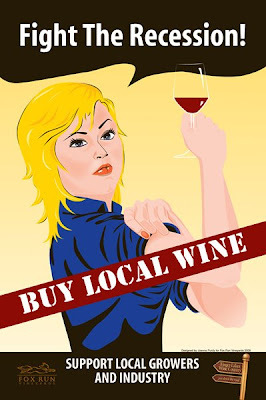 FIGHT THE RECESSION: BUY LOCAL WINE is the theme of a terrific new poster created by artist Joanna Purdy for Fox Run Vineyards that may be adapted to any part of the country. The poster is reminiscent of those during World War II appealing to self-help and community spirit, and may be seen at www.foxrunvineyards.com. The first 500printed copies of the poster have been funded by Finger Lakes Wine Country Tourism Marketing Association. For more information on adapting the poster locally, contact Leslie Kroeger at Fox Run (leslie@foxrunvineyards.com, 800-636-9786).